It is a dream of many to have a room set aside for watching movies. A trend that has picked up pace over the course of last couple of decades used to be reserved only for those with hefty paychecks. Nowadays, however, with medium investment, you could turn out to be one of the lucky ones. For all of you cinema enthusiasts out there, we’ve outlined a tutorial on how to get started with coming up with your new dream room. The basic guidelines here are that this room should be 20 X 30 feet in size and preferably isolated from the rooms you and/or your family spend most of the time in. If you’re lacking a spare bedroom, or open space above your living room (this is generally the size you’ll want to be on a lookout for), building a theater wing of a room might not be such a bad option. In general, however, you won’t exactly have much of a choice here – you will have to make do with what you’ve got at hand. Unless you’ve made a decision to buy a huge music studio when you were house shopping, you probably won’t have an already insulated room to opt for. 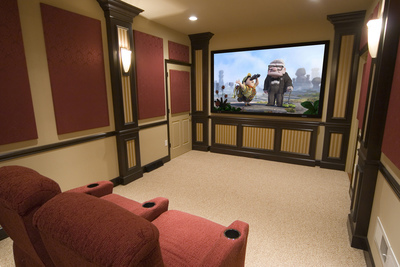 This is why sound insulation goes without saying in most cases – you will want to experience your favorite movies without being disturbed by the outside clamor, as well as without disturbing your neighbors. Regardless of this, the sound quality of a well-insulated space is incomparable to that of your regular room. If there is any furniture inside your future home theatre, you’ll want to rid yourself of it prior to starting the process of insulation. If you’re really serious about your home theatre, you should think about creating a raised seating area, so that everyone in the room has a good view, no matter their height. Once you’re done insulating, paint it in dark colors (red and black work great together, both in terms of light absorption and class). Done? Now let’s focus on the gear you’ll need. Movie streaming service - Compare broadband and streaming bundles in your region and opt for the best deal that fits your movie watching preferences. 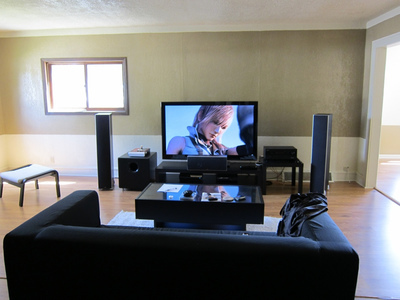 Speakers – A decent pair of speakers goes without saying, if you are serious about your home theatre. Receiver – This neat little device handles both your audio, as well as the video system. Everything, from your consoles to various other inputs, is plugged into the receiver. Think of it as a meeting point for the two, which enhances the experience. Cables – The only advice here is to always overestimate the length of the cables you’ll need. So there you have it – follow these couple of advice and dig a bit deeper into the internet and you’re ready for your movie theatre and all the enjoyment that follows!